From Kerryn's kitchen comes this beautiful autumn salad using fresh seasonal ingredients. The best thing about buying in season, is that the produce is at its absolute best! Not only do we get a good nutrient boost when eating seasonal fruits and veg, but the flavours are great and the colours are more vibrant. Autumn is my favourite season for fresh produce, with my picks being figs, pomegranates, beetroot, pears and persimmons (the fruit that looks like an orange tomato). These fruits and vegetables are versatile, provide interesting textures to any dish and look absolutely beautiful. 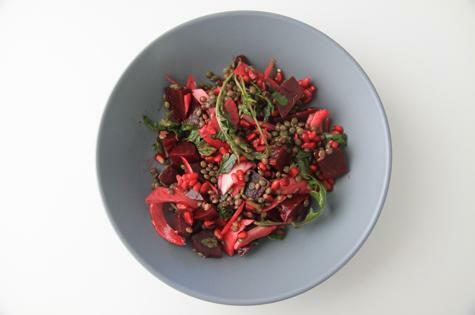 Just take this weekend's nourishing Autumn beet and lentil salad for example. The different textures gives it an aesthetic appeal and helps us to slow down when we eat it, forcing us to chew thoroughly and take our time to eat. The plant compounds that give the beetroot and pomegranate their vibrant colour packs powerful antioxidants that help ward of the seasonal colds. It’s fair to say that this is a great Autumn salad that is certainly good for us! 1. Preheat oven to 180 degrees (fan forced). 2. Wrap beet bulbs in foil and cook for 45-60 minutes or until tender. 3. Meanwhile, cook lentils in enough boiling water for about 20-25 minutes. 4. Once lentils are cooked and drained, combine with the fennel, pomegranate seeds, greens and parsley. 5. When the beetroot has cooled, peel skin and chop into chunks and add to the lentil mix. 6. Make dressing and gently stir through the dish. 7. Serve in individual bowls or on a large platter and top with feta if using. This is a great dish to make at the start of the week and enjoy for lunches. Lentils are a great vegetarian meat alternative, providing protein and low GI carbs, therefore leaving you full and satisfied! This dish is gluten free for those requiring a gluten free diet.